Before his dark thriller Hangman came out, Jack Heath was better known for his books for young adults. Hangman, which centred around the exploits of a self-confessed cannibal working as a civilian contractor to the FBI was definitely not suitable for children. There were probably some adults who would have baulked at the idea of a character who was paid for his services with bodies fresh off death row to satisfy his craving for human flesh. But even with this twisted premise, Hangman was a page-turning thriller, blackly humorous at times with some great twists. 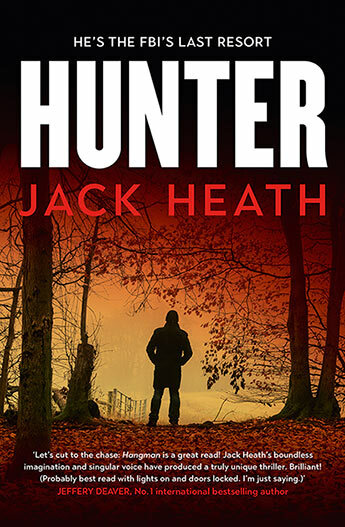 In Hunter, Heath returns to the dark world of Timothy Blake. With his previous supply of bodies cut off, Blake has had to find a new source and has done so working in victim disposal for a dangerous crime boss. Things start to get complicated when he is called in to help the FBI with a case of a missing academic and is partnered again with Reese Thistle, his old friend, still smarting from the way he treated her previously. And then his problems start to multiply– his new crime boss does not want him working with the FBI and by coincidence, the body of the man he has been asked to help track down is in his freezer waiting to be consumed. But this is just the start of another dark decent into the underbelly of humanity. Once again the highlight of the book is the character of Blake. While he was always more than a clever combination of Hannibal Lecter, Dexter and Sherlock Holmes, Blake emerges more fully in this book as he reflects on his past and starts to connect more deeply with Thistle. Blake, is the perfect guide to a dark world full of violence and depravity, believing that his own cannibalistic urges make him irredeemable and unable to be shocked. But even he is sometimes taken aback at some of the cruelty that he discovers and often works to save and protect those who can not protect themselves. Hunter is another compulsive page-turner. While there are a couple of niggling plot holes, the pace is fast enough to that they fly by. But it is not for the faint hearted. Heath seems determined to upend every rock he can find to expose the dark side of humanity to the point where hanging out with a cannibal who only eats bad people seems like the best option.